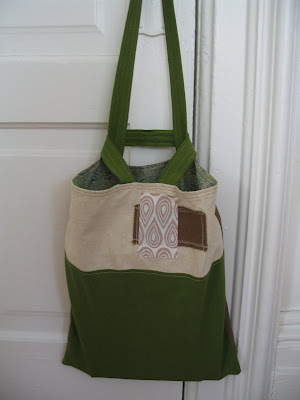 I sewed this little tote up this summer and it was I used it as a purse. I just realized that I never shared it with you! I have a bad habit of thinking that the quality of my photos doesn't justify me posting them on my blog. The funny thing is that I tend to use the original photos months later as if the photo has improved or something. I've got about 6 completed quilts that are not being shared for the same reason. Am I the only blogger that does this? Hey girl if you've got goods to share--just share'em!! I'm dying to see what you've been up to! simple and adorable! i love it! If I let that stop me, I wouldn't have a blog :) Cute bag! Just stumbled across your blog today and I love the perfection of your imperfection. I, too, don't post enough because I think my pics stink, or I try too hard to make them "arty".I'll post more if you do? !...And I love your use of linens. 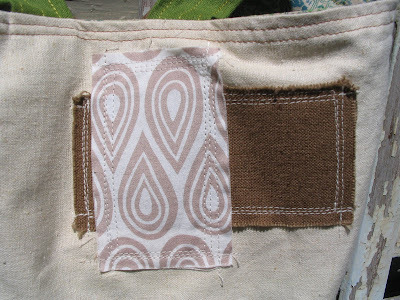 I am also addicted to it, and have vowed to use more in my quilts. Best. It is very interesting for me to read this blog. Thanks for it. I like such topics and everything that is connected to this matter. I definitely want to read a bit more on that blog soon.